It gives me great plea­sure to wel­come Kat­i­ca Roz­gonyi to CAPLINQ as our Logis­tics Coor­di­na­tor at CAPLINQ Europe BV and will be based in our Heemskerk, Nether­lands office. Katica to coordinate logistics as well as playing a supportive inside sales role. Kat­i­ca is from Szeged, Hun­gary and came to the Nether­lands to study Inter­na­tion­al Busi­ness and Man­age­ment at the Avans Uni­ver­si­ty of Applied Sci­ences in Bre­da. She start­ed out at CAPLINQ as an intern but we were so sat­is­fied with her per­for­mance we decid­ed to offer her a fixed posi­tion after her grad­u­a­tion. Kat­i­ca is a nat­ur­al orga­niz­er with a light­ning-fast intel­lect: able to make con­nec­tions between sit­u­a­tions and peo­ple to come up with solu­tions and new oppor­tu­ni­ties that no one else can see. Kat­i­ca is ambi­tious and cre­ative and looks for­ward to grow­ing with­in CAPLINQ’s Logis­tics depart­ment: will­ing and able to take on more and more respon­si­bil­i­ty. A good exam­ple of this is her recent addi­tion of inside sales respon­si­bil­i­ties. This means that on top of her logis­tics role she will also be look­ing after clients and qual­i­fy­ing poten­tial prospects into sales qual­i­fied leads. In her spare time, Kat­i­ca loves ani­mals includ­ing crest­ed ducks and looks after her Insta­gram celebri­ty ham­ster call Pignut (named after the flower). She also enjoys plays and the the­atre, muse­ums, and exhibits, and some­times writes poems in her native lan­guage. 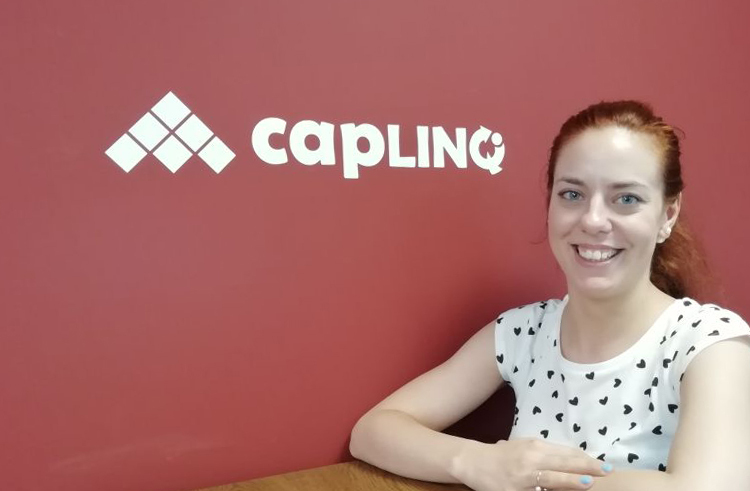 Please join me in wel­com­ing Kat­i­ca to this new posi­tion and wish­ing her a long and suc­cess­ful career with CAPLINQ.